Grid couplings are very sensitive to misalignment. They are designed to handle almost no parallel shaft misalignment, and only minimal angular misalignment (as called out in the Lovejoy grid coupling rating chart and the coupling pre-selection guide below). While misalignment must be considered and proactively addresses when using a grid coupling (see Why Lovejoy Offers Shaft Alignment Dial Indicator Kits), there are several major benefits to using a grid coupling. The biggest is that it is an all metallic flexible coupling design that can transmit significant torque in a small footprint (high power density) while also (unlike metallic gear & disc couplings) providing system vibration dampening capability. Grid couplings are a well proven technology, and are readily available from stock from a few leading coupling brands (inclusive of Lovejoy). While the power density of a grid coupling is enviable, one final drawback to consider when selecting a grid (or gear) coupling is the fact that it requires lubrication (grease). 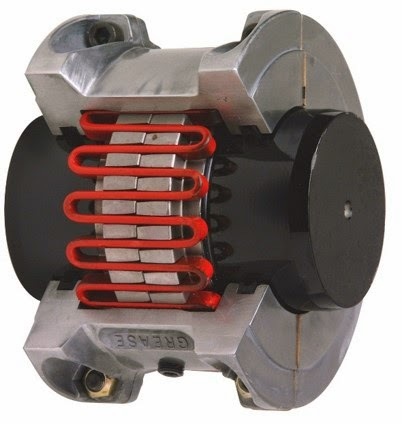 Unlike elastomeric flexible couplings (which generally also provide system vibration dampening capability at lower power density levels), this means your maintenance team will need to periodically re-grease the coupling through the lubrication ports on the coupling's cover and be careful to avoid and/or properly address any grease leakage environmental concerns. Alternatives to grid couplings include disc couplings (see Why to Switch from Grid to Disc Couplings), which avoid lubrication concerns but do not offer the grid coupling's level of vibration dampening, and jaw in-shear couplings (see Jaw In-Shear Couplings - A Straight Forward Value Add) which avoids lubrication but has a lower power density.